Climatic conditions, such as temperature, wind and humidity, and valley floor/edaphic conditions, such as soil water availability and drainage, often force the establishment of vineyards towards complex terroirs where aspect, slope, relief, erosion and execution of viticulture practices are determining factors in the orientation of vineyard rows. The above may lead to a single row orientation per block or multiple row orientations per block, e g when vineyards are established along contours or rows are curved. Depending on the orientation of the row/canopies, the angle of incidence of the sun may affect light and temperature profiles in the rows, as well as inside the canopies. Furthermore, within a chosen trellis system, the physical horizontal and vertical dimensions of the canopy as related to the spacing and orientation/positioning of shoots would also affect the climatic profiles. Climatic and orographic conditions of the vineyard site would therefore naturally superimpose onto the vineyard row orientation chosen during establishment for the purpose of sustainable viticulture and oenology. The effect of row orientation [North-South (NS); East-West (EW); North-East-South-West (NE-SW); North-West-South-East (NW-SE), each replicated five times on a flat site of approximately 3 ha] at fixed row (2.7 m) and vine (1.8 m) spacing, on climatic profiles of canopy and grapes of spur pruned (two buds) vertically trellised Shiraz/101-14 Mgt, was determined at the Robertson Experiment Farm of ARC Infruitec-Nietvoorbij in the Breede River Valley, a region that experiences semi-arid macroclimatic conditions. Due to low precipitation and inconsistent rain events in summer, vines were irrigated weekly at a volume of 14 mm during the high season period. A cover crop (rye) was sowed after harvest and killed before budding. Vines were uniformly managed and were only vertically shoot positioned and topped; both actions were performed on average three times per year. Meso- and microclimate profiles were continuously monitored during three consecutive seasons by means of sensors, and data logged. Meso photosynthetic active radiation (PAR) (400 – 700 nm) and soil reflected radiation were recorded approximately 0.5 m on top of vineyard rows. Micro canopy filtered radiation, as well as temperature (°C), were measured in the bunch zone. PHOTO 1. (a) Complete experiment layout and a (b) close-up view at treatment level of the experiment at Robertson Experiment Farm of ARC Infruitec-Nietvoorbij, Breede River Valley, Robertson, South Africa. 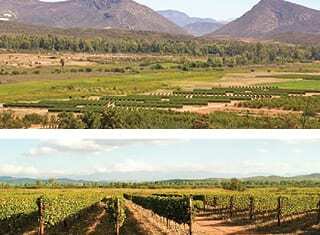 The Breede River Valley experiences semi-arid conditions. According to weather station data, the pre-véraison period (green berry growth stages up to berry colouring/véraison – more or less from September/October up to first half of January) is warm (maximum temperature 27 – 30°C) and the ripening period (from after berry colouring – more or less from middle January to end of March) hot (maximum temperature >30°C). Average macro temperature normally increase from approximately mid-December (around pea berry size) and maximum temperatures frequently reach more than 30°C from there on. Radiation seems to pick up from the beginning to the middle of the growth season/beginning of berry ripening (January – corresponding to véraison), whereafter it decreases towards the end of March. In line with the macroclimate radiation profiles, ambient (mesoclimatic) photosynthetic active radiation measured on top of canopies was highest during the period November to January (Figure 1). Seasonal patterns of photosynthetic active radiation, received in bunch zones at microclimate level after been filtered by the canopy, showed that EW-orientated rows maintained lower interior canopy interception than other row orientations (Figure 1), decreasing during the season as canopies developed and generally peaking just after mid-day. The NS orientation displayed highest values, peaking in the morning and in the afternoon, whereas NE-SW and NW-SE orientations showed peaks primarily in the afternoon and morning, respectively. 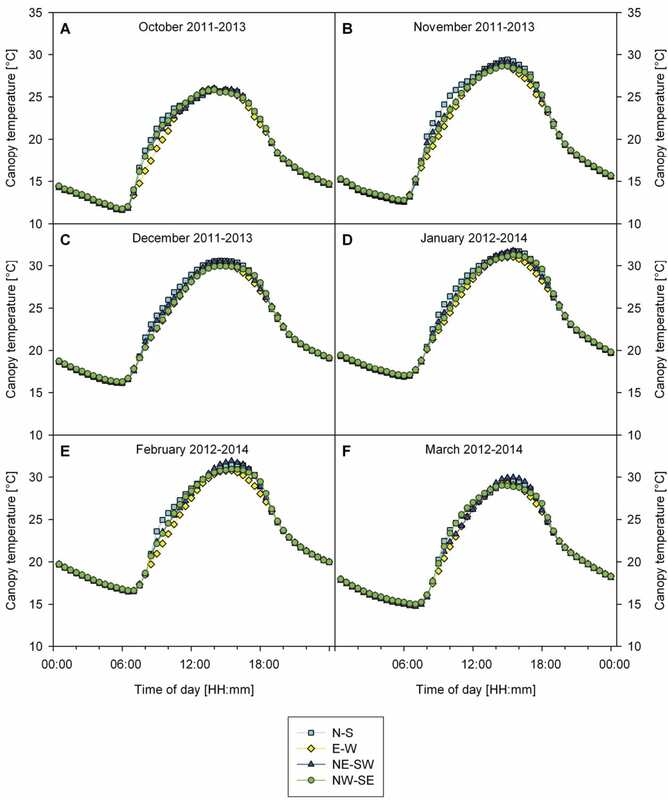 Average radiation reflection from the soil (as received by the canopy) during the grape ripening period showed more or less similar trends, but interception shifted towards the afternoon for NS and NE-SW orientations, whereas EW and NW-SE orientations showed uniform trends with optima at mid-day. Interestingly, in comparison to other orientations, EW-orientated vine rows captured the largest portion of total radiation from soil reflected radiation (data not shown). This may change with different soil type (e g clay vs calcareous vs stony vs sandy soils) and different soil covers/mulches, affecting the colour of the surface. The contribution of soil reflected light to the total light component captured in canopies of vines grown in different soil types and with different soil mulching may have significant effects on the composition (e g far-red:red ratio) of the total light spectrum received by leaves and berries. In this way, it may affect enzyme activity involved in primary and secondary metabolism in these organs. The porosity of the canopy would, however, play a large role in this regard. Changes in soil type may also result in changes in radiant heat, which may further affect berry temperature and composition. Humidity in the bunch zone may be affected, especially in regions where frequent irrigation is required during summer. FIGURE 1. Micro hourly mean photosynthetic active radiation of Shiraz/101-14 Mgt vineyard planted to four different row orientations at Robertson Experiment Farm of ARC Infruitec-Nietvoorbij. Although quantity (and most likely quality) of light is very different, EW and NS orientations may generally be considered as causing most uniform light distribution in canopies. However, implications for e g canopy disease occurrence may be very different as an inverse relationship between polyphenolics produced when leaves are exposed and severity of downy mildew was shown; this may equally well apply to grape bunches, in which case it was shown that berry phenolic composition reacted positively to judiciously controlled sun exposure. In this respect, leaves should be managed in such a way that grapes are not over-exposed; if so, positive effects may likely be nullified and even reversed. Plant phenolics have for a very long time been implicated in defence against invading phyto-pathogens. This is a critical aspect during especially pre-véraison canopy development stages of the grapevine when pathogen infection of the canopy should be prevented in order to secure a healthy, efficient and sufficient canopy during grape ripening. Row orientation may therefore be a natural way to enhance defence mechanisms against fungal diseases. Except for generally slightly lower and higher morning temperatures of EW and NS row orientations, respectively, canopy interior temperature profiles did not show marked differences between row orientation treatments (Figure 2). In general, temperatures peaked at approximately 30°C from December onwards at around 15:00 – 16:00. In January and February, canopy temperatures were highest at just over 30°C. Since canopy vegetative characteristics were relatively uniformly controlled for all treatments, canopy interior temperature might have been primarily masked and driven by diurnal ambient air temperature. FIGURE 2. Micro hourly mean canopy temperature of Shiraz/101-14 Mgt vineyard planted to four different row orientations at Robertson Experiment Farm of ARC Infruitec-Nietvoorbij. Light exposure and ambient temperature have differential effects that are not easily separated under field conditions. Sunlight exposure and temperature are well-known regulating drivers of modification of whole plant and berry size (along with water availability, evapotranspiration and transpiration) and the wide variety of biochemical and physiological processes taking place pre- and post-véraison in both canopy and grapes. Oenological quality potential of grapes is largely determined by these two environmental factors. 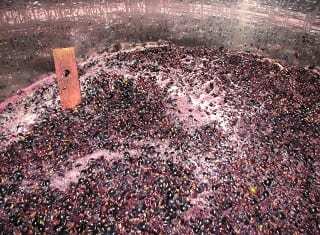 It has already been linked to the matrix of sugar accumulation, anthocyanin formation, flavonol and tannin contents, and terpene, carotenoid and methoxypyrazine synthesis and maintenance in both red and white grapes. Row orientation as viticulture practice is therefore of critical importance in the quest for grape and wine quality/style. • Climatic profiles of vertically trellised grapevine rows are extremely important in expectations and interpretation of vine physiological and morphological processes. 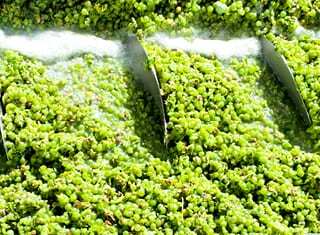 • Row orientation would affect grapevine behaviour at levels of leaf function, bud fertility, yield, berry development, berry temperature, berry composition, shoot lignification and whole plant health. 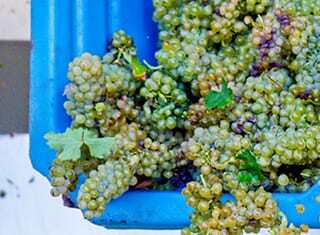 • Irrespective of the orientation of the rows, canopy density is a determining factor in the composition of the (light and temperature) climatic environment to which leaves and grapes are subjected during growth. • Canopy architecture needs to be managed well in order to gain the most benefit in yield and grape and wine quality from row orientation as viticulture practice. • Row orientation is one of many viticulture practices that are all complimentary to each other; judiciousness of choices and execution of each practice would determine the final outcomes. • Although latitude impacts on solar incidence angles, results have global relevance and are critical in decisions for future vineyard establishment, whereas it would facilitate management and understanding of outcomes of already established vineyards. Canopy light and temperature profiles of differently orientated vertically trellised Shiraz grapevines (NS; EW; NE-SW; NW-SE rows) were investigated. The EW-orientated rows showed lowest interior canopy interception, peaking just after mid-day. The NS orientation displayed highest values, peaking in the morning and afternoon, whereas NE-SW and NW-SE orientations showed highest peaks in the afternoon and morning, respectively. Canopy density affects the microclimatic environment, irrespective of row orientation. In order to gain most benefit in yield and grape and wine quality from row orientation as complimentary viticulture practice, choice and execution of each practice should be carefully considered and executed. Hunter, J.J., Volschenk, C.G. & Zorer, R., 2016. Vineyard row orientation of Vitis vinifera L. cv. Shiraz/101-14 Mgt: Climatic profiles and vine physiological status. Agricultural and Forest Meteorology 228, 104 – 119. – For more information, contact Kobus Hunter at hunterk@arc.agric.za.